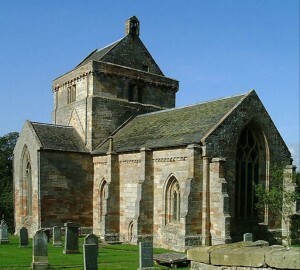 Crichton from the south east. We think that this is quite a good picture of Crichton Church taken in the early autumn. It goes to show that it is not always raining in Scotland! This is a very tranquil place with a seat thoughtfully provided. When the weather is good, especially in late summer and early autumn, there can be no better place to sit quietly, read the good book and contemplate.